They were all young once, the men in the murals that now grace the walls of the old Masonic Hall in Sherman. Satchmo is up there. So are Dizzy and Doc, Miles and Maynard, Bix and Al, Bunny and Harry, and more. Over the decades, these men of music—American music, jazz—set the tone for trumpet players that will resonate like their sounds for as long as other young men pick up a horn. On May 8, a concert at Kidd-Key Auditorium featured the University of North Texas One O’clock Jazz Band with Wayne Bergeron and Denis DiBlasio, and heralded the opening of the Sherman Jazz Museum, a tribute to all men with horns and other musicians who brought jazz to the world. The museum is an ongoing, living monument of sorts to William Wheat Collins II and Margaret Binkley Collins, a couple who loved music almost as much as they loved their home town of Sherman. “My father wanted to build a jazz museum,” said William Wheat Collins III, the dutiful son who is superintending the completion of this father’s dream. But it’s his dream too. A long time professional musician, who played trumpet in the Dallas Fort Worth area for most of his career, Collins is coming home with this project, well, sort of. “I grew up in Fort Worth, but we came to Sherman a lot when I was younger, and so it was like a second home. We’ll be moving up here once the museum gets going,” he said. The “we” is Bill, his wife, Susan, and their daughter, Cathy, who is the museum’s curator. “Dad loved jazz,” Collins remembered. “In the early ‘40s, he said he could have played somewhere seven nights a week and he played with dance bands every Saturday night until his sixties. Bill Collins II played just for the love of it into his nineties. He died in 2008 at the age of ninety-five. The keystone of the museum’s collection is material from the Maynard Ferguson estate, which the two Bills acquired at auction in 2006. “All the material belongs to the foundation,” said Collins. 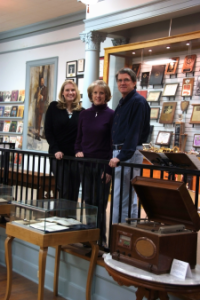 Cathy, Susan, and Bill Collins at the new Sherman Jazz Museum. The albums are as integral to what Collins believes the museum should be about as the portraits on the wall and the trumpets in the cases. 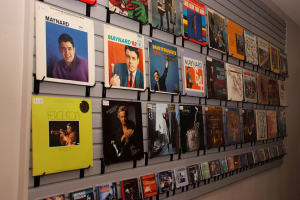 “The idea is that people can come in and look at the exhibits and then take the albums off the wall and read about the music,” he said. Bill Collins II prized education as well as music, and his son wants the museum to become a place where high school and college kids can come to experience the music some have called America’s greatest artistic gift to the world. Collins wants it to be a place not just to hear and read, but to touch and feel as well, to sit at Duke Ellington’s practice piano or hold Dizzy Gillespie’s horn with the upturned bell. “The thing I’m most excited about is bringing the elementary and junior high kids in here to learn about jazz. If you start kids early, while they’re still developing, it will change how they listen to music.” And there’s so much more Collins wants to do. He talks about a big band museum on the second floor of the hall, and regular concerts by the world’s top jazz musicians at Kidd-Key, with seminars for people who want to sit and talk and learn from the people for whom music is their life. All in all, as far as Bill Collins III is concerned, the Sherman Jazz Museum is just the opening bars of a much longer piece of work, and like jazz, it will probably be improvisational in its approach. He is the man in the lead chair now, but it all started with another Bill Collins, another one of those young men with a horn. Bill Collins II was a long-time executive with the Department of Housing and Urban Development, but while his head was in the intricacies of HUD, his heart was always on a bandstand. 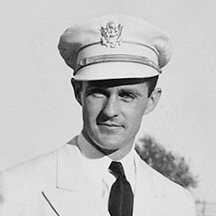 After graduating from Sherman High School in 1930, Collins enrolled in Texas A&M, but hard times and scarce cash brought him back from College Station to a job as a clerk to a local cotton buyer in Sherman. To augment his wages, Collins led a five-piece jazz dance band at a Denison nightclub called El Taos. The music business quickly proved more lucrative than the cotton business, and for the next few years Collins hit the road, playing with dance bands all over Texas and the Midwest. Eventually he saved enough money to go back to school, this time at North Texas State Teachers College in Denton. 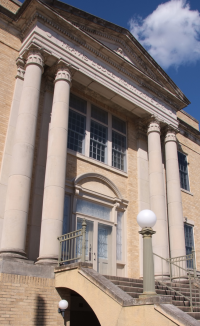 The Sherman Jaxx Museum is located in the historic Masonic Temple on Lamar Street. The landmark building was built in 1924. He earned an undergraduate degree in economics from North Texas in 1937 and a Masters Degree a year later. He also pursued his music education and a Texas Band Director’s Certificate at NTSTC, a college already becoming an educational high note on the jazz scene. As a young man with a head as well as a horn, Collins was on his way to the University of North Carolina to work on a PhD when he decided to change his tune. Sherman High School needed a teacher, and although Collins didn’t have the two years teaching experience SHS required, the school board offered him a dispensation, so in the fall of 1938, Sherman High had a new government and economics teacher whom most folks called “Billy.” Collins was a Bearcat through and through. He had played in various musical groups while in high school, but what he hadn’t played in was a Sherman High School band. There wasn’t one, back then. There wasn’t one in 1938 either, and Collins was determined to do something to rectify the situation. What? No high school band? For goodness sakes, it was 1938, and every kid in America who could play a tissue paper and comb dreamed of being Benny Goodman or Glenn Miller. A word of explanation is needed here. After the Great War, instrument manufacturers got on a band wagon so to speak to promote municipal bands. This was a time when Americans still entertained themselves. The movies were silent, radio was a crackling, static-filled newcomer to the county, and windup Victrolas offered only a few minutes of music on a fragile disk. If you wanted music, you had to make it. A bandmaster such as John Philip Sousa would set toes tapping with his touring band, and if he could do it, so could you and your neighbors—if you had a town band. The Sherman Municipal Band counted off for the first time in 1921, funded by the city’s general fund and contributions from local music lovers. In 1929, the city enacted a special band tax to cover the group’s cost and the salary of its full time conductor. The band, made up of volunteer musicians, offered regular concerts and played for parades and Bearcat football games, but that wasn’t enough for the kids at SHS. It wasn’t their band. By 1937, the school board had decided to listen to the kids and had come to the conclusion that SHS need an accredited music program and an independent band with a director who answered to them and not to the city fathers. Well and good, but the city council wasn’t so keen on the idea. The city had a band, why burden the tax payers with the cost of another one? Enter Billy Collins, young man with a horn and a bent for a little municipal intrigue. “The first thing I did was join the municipal band,” he said in a 2000 interview. “Then I neutralized them.” By them, he meant the influential threeman band committee. The Sherman Jazz Museum is home to more than four thousand vinyl LPs, CDs, reel tapes and cassettes featuring music over a span of 85 years. 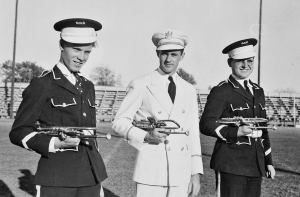 When the school board announced plans for an independent high school band in the spring of 1939, the protests of the Municipal Band Committee were muted, and the Bearcat Band was born. Its director, Billy Collins, put on a uniform, picked up his horn and led the parade. The high school band was a great success, and by 1942, the Municipal Band was history along with the band tax. Collins was in the navy by then, but before he left Sherman in 1940, he wrote his alma mater’s first alma mater. The tune survives still as the Bearcat Fight Song. Such a fabulous story about fascinating people and the great American invention of jazz. Thanks for sharing and I look foward to the museum’s opening. Exciting news for Sherman! Want to say goodbye to yo-yo dieting? Are you ready to take an active role in achieving your life-long, weight-loss goals? If you or someone you know is struggling with morbid obesity and suffering from its related health conditions, Sherman Lap-Band can help!